Reviewers continue to rave about the MacBook, including the sharp display, unusual keyboard, battery life, value, and performance. Macworld has updated their review to cover both black and white MacBooks, and they've uncovered a real performance difference depending on which hard drive is installed. Some MacBook owners are experiencing case discoloration. We've included a photo, a link, and one suggestion for cleaning up the problem. And Trans Intl has upgrade hard drives available for the MacBook. New MacBook: Tool or Art Object? "I am certainly willing to admit when I am wrong, and boy was I wrong on this one. After writing about how unimpressed I was with my initial impressions of the new MacBook, I had a chance to play with one at the Apple Store. I left with a black MacBook under my arm. "I've had a lot of Apple laptops. If I took the time to count them all up, I'm certain I've had at least one of every model since my first, a Duo 230 in 1993. This new MacBook beats 'em all. Soundly. "And the build quality is far and away the best of any Apple laptop ever released." "With two exceptions, Apple has always made excellent portable computers. 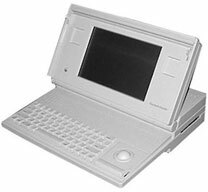 "Ignoring the Apple Portable (over 10 kg) and the 5300 (some caught fire), Apple's laptops have been examples of how to design and build a notebook computer." Editor's note: The Mac Portable was a pretty good computer in the context of its time, just not great as a laptop at 16 hulking pounds (a lead-acid battery didn't help, although it did provide a long runtime between charges). "The MacBook's screen is glossy.... The glossy screen shows off blacks and whites well, but fluorescent lighting also splashes off the screen - we're undecided as to whether this is a better deal. "The keyboard is pretty odd-looking, with keys mounted individually in the case, but in use is very comfortable. The trackpad is of the same relative proportions as the screen, and dragging two fingers across it instead of one allows you to scroll up, down and sideways." "The first and most obvious design feature of the MacBook is that it comes in two colors - white and black. Internally, the white and black MacBooks are exactly the same. The only non-customizable difference between the black and white MacBooks is a $200 premium for the black encasing. "AppleDesigned the MacBook with a very quiet 4x SuperDrive (or Combo drive on the base model). This is the exact same SuperDrive being installed in current MacBook Pros. Even though the SuperDrive is only 4x, it burns CDs and DVDs quickly and stably. The 4x SuperDrive can read dual-layer DVDs, but it can only burn single layer disks." "When we first posted our review of Apple's new MacBooks, we didn't include a mouse rating or benchmark results for the white 2.0 GHz model. The reason for this omission? While we were able to get our hands on the 1.83 GHz and black 2 GHz MacBooks fairly quickly, it took a little longer to track down that third model. "Well, the white 2 GHz configuration arrived finally, so we put the laptop through our battery of tests. You might think, 'Why did they bother?' After all, aside from the case color, the only other difference between the white and black 2 GHz MacBook is the hard drive - a 60 GB 5,400-rpm drive in the white model and an 80 GB, 5,400-rpm one in the black. And if you were to look at their scores on our overall system performance testing tool, Speedmark, you would find data to back up that position. "However, the differences in some of the individual tests that make up Speedmark were big enough that we rushed the black the MacBook back from its offsite photo shoot to run some more tests. After testing the white 2 GHz MacBook and comparing the results to the published scores of the black model, we saw small performance differences in many of the tests, with the edge going to the white model in most cases...."
"What's more interesting is how little you give up by sticking with the least expensive model - not surprising, perhaps, given the relatively close speeds of the processors inside, but very nice in that Apple hasn't crippled its entry-level laptop. "As with all Intel-based Macs, however, applications that have not yet been updated to run natively on Intel chips must use Apple's Rosetta dynamic translation technology, and those apps perform much more slowly than they do on older PowerPC-based Macs. "In our Photoshop CS2 tests, for example, the 1.83 GHz MacBook took almost 68 percent longer to complete our suite of tests than the 12-inch PowerBook, while the 2.0 GHz MacBook took 53 percent longer (this was the biggest difference between the two MacBook speeds in our benchmark tests)." "I reviewed the MacBook Pro earlier this year, and lately I've been testing the new MacBook, a handsome machine that packs a very good screen and keyboard into a fairly thin enclosure and is surprisingly inexpensive. "There's a lot to like about the MacBook. It's a very good choice for anyone considering a Mac and operating on a tight budget. Like the other Intel-based Macs, it can even run Windows alongside Apple's own Mac OS X operating system. But it is missing some key features that are standard on Windows-based laptops, and it is heavy compared with its closest Windows competitor. "The first thing you notice about the MacBook is its sharp, vivid 13.3-inch screen, which is larger than the 12.1-inch displays in the latest rash of relatively small Windows laptops. The MacBook screen is glossy, which makes for sharper contrast. Such screens can be subject to annoying reflections, but I didn't find that to be a problem. "Perhaps the most surprising thing about the MacBook is its price. Despite Apple's reputation for charging more, the MacBook is actually less expensive than its closest major Windows competitor...."
"There's been much gnashing of teeth on various Mac forums since the new 13" widescreen MacBooks were released earlier this month. One of the things that some folks have fretted about is the new keyboard design. The keys don't have the traditional wider-at-the-bottom, slightly-dished tops of most boards. A fair number of touch typists have declared the machine completely unuseable - some even without ever actually touching the keyboard. "Hmmm . . . 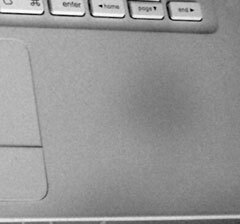 I've been touching typing since I was 14 and I've yet to lose my place on my new MacBook's keyboard. Really, it's not at all like the cheap 'Chicklet' keys of various Jurassic-era computers. "In fact, it's probably the best Mac laptop I've ever used: the widescreen format and high resolution create a roomy desktop for working with lots of windows simultaneously. The screen is much brighter than previous models. That alone makes it very easy on the eyes, even when working on it for long hours at a stretch." Link: New MacBook: Tool or Art Object? "The spots don't wash off, I've only had the MacBook for two weeks. Genius at Apple Store told me to call Apple about it, as he's never seen anything like it. My iBook didn't discolor in the 3 years I had it - can't be my hands. I don't smoke, don't use latex, etc. And for those who worry about my hygiene habits, thanks. I wash my hands. "More people are having this issue in the Apple Discussions...."
Trans international announces worldwide availability of Serial-ATA mobile drives for the new Apple MacBook. Trans SATA mobile (2.5") hard disk drives delivers a winning combination of characteristics. With the industry's lowest idle power and enhancements to the mechanical and electrical design, these 5400 and 7200 rpm drives with outstanding shock characteristics, extremely efficient power consumption, whisper quiet acoustics, and a range of speeds and capacities are ideal choice for Apple MacBook and MacBook Pro.